Arriving faster than you can say ‘mamma mia’ is the upcoming Palm Sunday or La Domenica delle Palme as it is called in Italian. This day is when the Christian church marks the start of Settimana Santa or Holy Week. This ancient holiday is the celebration of the arrival of Jesus in Jerusalem, and to celebrate the feast of Passover a week before his resurrection. Many might wonder just why this Sunday is referred to as 'Palm' Sunday? The reason behind this is because of the palm branches used as part of the festivities. Legend has it that the crowds laid down palm branches and waved them in the air to greet an arriving Jesus. Typically in Italy, they replace the palm branches with olive ones which also symbolize peace. Palms are less common here and olive branches make for a great alternative during the Holy Week's extensive celebrations. Typically these branches are kept in big bunches at the front of the church and handed to those who enter to hear mass. The Palms themselves can be worked on to become crosses or even elaborate flowers. Some churches in Italy still respect the ancient tradition of having the priest knock three times outside of the closed church doors to represent the entry of Jesus in Jerusalem. The priests wear deep scarlet red robes, the color of blood, to indicate Jesus' sacrifice, passion and resurrection in Jerusalem. 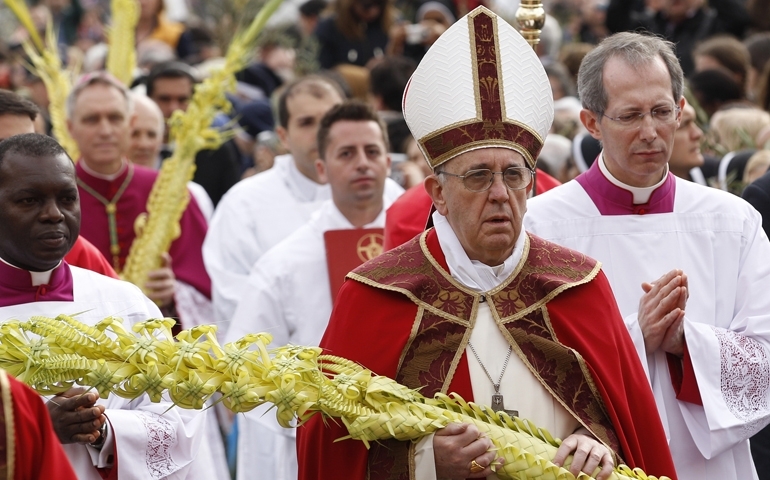 For those in Rome this Palm Sunday, starting at 9:30/10am, there will be the blessing of the palms by the Pope, followed by a procession and mass in St. Peter's Square. Expect plenty of celebrations all over Italy since the Easter holidays typically tend to still be quite popular with locals out and about for their after-lunch passeggiata. You can see the official schedule of the Holy Week released by the Vatican here.